Tim and Tara Hallman are the parents of a new baby boy, their fourth child. Eli Martin was born at 12:40 am on Monday, March 26, weighing 7 pounds, 11 ounces, and 21 inches long. Everyone is doing fine. Tim Hallman is pastor of Anchor Community Church in Fort Wayne, Ind., and the son of longtime UB minister Gerald Hallman. Pictured are (first row, from left) Kaitlyn Coomer, Erika Waugh, Kristen Godby, Kelsey Reno, Steve Goss. (Second Row) Corina Donaldson, Billie Brooks, Shane Meyer, Elijah Williams, Kelly Herring. 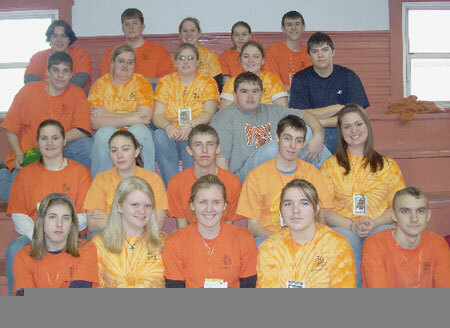 (Third Row) Tanner Kline, Chelsea Williams, Heather Wyckoff, Justin Clark Samantha Guerrette, Gary Brooks. (Back Row) Seth Tobias, Cody Joy, Shaylyn Allen, Natalie St. Clair and Jeremy Grove. The West Pleasant Hill UB church of Rockbridge, Ohio, sponsored a 30 Hour Famine in which 21 teens representing ten different local churches participated. They joined approximately 500,000 teenagers nationwide, aiming to raise $12 million while getting a real taste of hunger as they helped feed and care for children living in extreme poverty around the world. Now in it’s 16th year, World Vision’s 30 Hour Famine raises awareness and money to fight hunger overseas and in the United States. During the 30 hours, participating teens go without food (consuming only liquids), learn about world hunger and poverty, and perform community service projects. According to youth director and organizer Sheila Meyer, this group of teens was one of the greatest to work with since starting this program at West Pleasant Hill about ten years ago. This local group boxed 10,750 pounds of food by working at the Southeastern Ohio Regional Food Center in Logan. They raised $3,080 in donations to send to World Vision. Every dollar raised is matched by U.S. Government grants, which give Famine donations raised in 2007 four times the effectiveness! The entire congregation gets involved along with the teens and their families by holding a carry-in dinner at the end of the famine. “Global Ministries set April 26 as the target date for Billy Simbo to leave for Sierra Leone and begin his role as the highest leader of our churches there. Billy is going as a United Brethren missionary and will serve for three years. He will work with 55 churches, many schools, the Mattru Hospital, and new church planting ventures. “Billy will likely leave first. Mamei will finish dealing with some medical issues, and then will join her husband. Registrations for the 2007 US National Conference have been streaming in continuously. Over 100 were added in the past week, bringing us up to 380 registrations as of Friday, March 23. Persons from 88 different UB churches (including one UB church in Canada) are now registered for the May 31 – June 3 conference in Huron, Ohio. Of the registrants, 100 are ministers, and 70 are the spouses of ministers (there will be special workshops designed just for pastors’ wives). We also have 52 children registered. March 15 was the deadline Bishop Ron Ramsey set for churches to return the National Church Covenant. As of March 23, 144 of the 209 possible churches had returned the covenant, so we’ve got a ways to go there. The Discipline calls for cluster leaders to organize congregational meetings in churches that have not returned the covenant by April 1, to determine if their intention is to not sign the covenant and withdraw from the denomination. If some other reason has prevented you from returning the covenant, please let the bishop know, so that time and effort isn’t wasted in organizing congregational meetings. As of March 22, we were still waiting on election results from about 60 of our churches (the deadline for reporting was March 15). In addition, 44 pastors had not submitted their annual reports for 2006 (for this, the deadline was March 1). We’re anticipating a superb experience at the US National Conference. It will be unlike any previous UB gathering, and certainly far different from any previous national conference or general conference. The early registration period lasts until April 1, after which registration rates go up $10. Delmon was a sharp young man from one of our United Brethren churches in Haiti. For four years, he prayed for the chance to study for the ministry. He finally got that chance, and was able to enter Jamaica Bible College. On March 22, Delmon underwent surgery for an aortic aneurysm, and the need to replace his aortic heart valve. Owen Gordon, President of Jamaica Bible College, informed us this morning that Delmon was unable to overcome the complications. He died last night. The Indiana State Board of Nursing has approved Huntington University‘s application to begin offering a Bachelor of Science in Nursing degree program in the fall of 2007. The board announced its decision at a meeting in Indianapolis on March 15. “Nursing will be a very strategic addition to our academic programs and will expand our ability to educate students to impact the world for Christ,” said Dr. G. Blair Dowden, president of Huntington University. This state approval process involved providing extensive evidence of the appropriateness of the curriculum, the faculty, the nursing director and resources to support the program. “I want to congratulate Dr. Pat Pierce, who authored our lengthy application to the State Board of Nursing and has worked tirelessly to lay the groundwork for our nursing program,” Dowden said. Pierce is the university’s interim director of nursing. In January, Huntington announced that Margaret Winter had been hired as the director of the Department of Nursing. Next, the university will seek professional accreditation for the new program from the Commission on Collegiate Nursing Education. CCNE is an independent accrediting agency recognized by the U.S. Secretary of Education as a national accreditation agency. CCNE assesses baccalaureate and graduate nursing programs. Meanwhile, construction on the university’s nursing facilities will be completed in the coming weeks. The program will be housed in the lower level of the state-of-the-art, 93,000 square foot Science Hall. Equipment and supplies will be moved in before classes begin in the fall. Dr. G. Blair Dowden, president of Huntington University, is the 2007 recipient of the Charles Morris Athletics Administrator of the Year award presented by the National Association of Intercollegiate Athletics. He is the first president to receive the award, which is given to administrators involved in all of phases of NAIA athletics programs. Dowden received the award on March 18 at the 66th Annual NAIA National Convention for his service to the association. Dowden, who is in his 16th year as Huntington’s president, has served the NAIA at the conference, regional, and national levels. From 1997-1999, Dowden was the founding chairman of the Mid-Central Conference Council of Presidents. He also has been a presidential representative to the NAIA’s Regional Management Committee. In 2001, he served as chairman of the NAIA Council of Presidents and then continued as a member of the NAIA Council of Presidents Administrative Committee from 2002-2005. The Huntington University Foresters compete in 14 intercollegiate sports for men and women. In the past eight years, Huntington has produced 57 NAIA All-America honors and 122 All-America Scholar Athlete honors. Mongul UB church (Shippensburg, Pa.) held a big surprise anniversary bash on Saturday, March 17, for Paul and Grace Runshaw. They are age 87 and 85, respectively, and have lived in the tiny village of Mongul for nearly 60 years. Eight of their ten children are still living, seven of them locally. Tim Flickinger, pastor of Fowlerville UB (Fowlerville, Mich., was one of two judges for the town’s annual chili cookoff, which this year raised about $1100 for the July 4 fireworks show. About 15 entries were judged. 12 Mar Jamaica Missions Trip – with Video! Persons from five UB churches recently completed a mission trip to Halse Hall in Jamaica. Those churches were First UB church and Faith Community Church (Findlay, Ohio), Avlon (Junction City, Ohio), Hopewell (Auburn, Ind. ), and Lake View (Camden, Mich.). The group started construction on a new boys school that is designed to take boys off the streets and teach them life skills. During that trip, child evangelism was conducted and 16 children accepted Christ. Of those 16, six remain in the church a month and a half later.